Inspired by Leonardo da Vinci's crazy drawings of flying objects, the world-renowned French arts group La Machine designed Aeroflorale II - an animated industrial garden that originally appeared at the Bauhaus Color Festival in Germany last year. 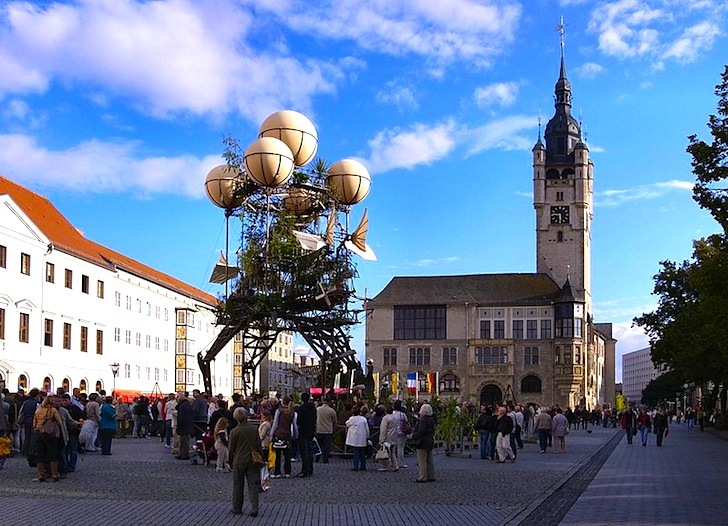 Although it doesn't fly, the 18 meter tall sculpture is adorned with hanging flora, propellers, fins, balloons, and other interesting objects that give the impression that this unusual structure actually is airborne. More than just a publicity stunt, this project also has a wonderful environmental ethos. Hit the jump for more details and a peek at the flying garden in motion. This is not the first time La Machine has awed the world with its strange sculptures. Previously the group created a moving metal spider and a giant iron elephant – projects that Architizer compared to Vladimir Tatlin’s unrealized Constructivist Tower that would have been erected in Petrograd following the Bolshevik Revolution. In addition to being an impressive work of industrial-chic art, Aeroflorale II is also part of a botanical expedition that collects crops and plant life from around the world with the aim of developing alternative sources of energy – a feasible plan considering that researchers have developed potato-powered batteries and other plant-based energy solutions. We can’t speak for Leonardo, but we suspect he would be pretty chuffed by the Aeroflorale II! It is adorned with propellers, fins, and hanging gardens - in addition to other strange objects. Although we can't speak for Leonardo, we have a hunch that he would be quite pleased with this incredible design.